This is a question that I regularly ask during strategic planning workshops and one which leaders answer from a systems and process perspective. While systems are necessary for any company, most are not unique ,therefore, systems and expertise that are easily copied provide little competitive advantage. However, systems and processes are driven by core competencies which are the sum of collective learning across business units over time and they have become embedded in the organisations culture. Core competencies are a source of competitive advantage since they are difficult to imitate because they are built through a process of continuous improvement that often spans a decade or longer. Unlike physical assets core competence does not deteriorate over time although it still needs to be cultivated, nurtured and protected. However an organisations competence base will become outdated as changes in markets, technology and regulations impact. Strategic planning for core competence involves identifying the core competencies required to react to planned changes. 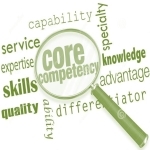 Developing a portfolio of core competencies enables exploitation to produce a variety of products enabling the organisation to diversify and this is often where organisations fail to exploit competence for competitive advantage by assuming that those competencies are unique to that business unit and keeping competence imprisoned within the unit. If core competencies are imprisoned then a business unit will not have the ability to pursue the opportunity that matches its competency profile and the opportunity to exploit and cultivate core competencies is limited . During the strategic planning process it is vital that leaders identify the competence carriers across the organisation that will make realisation possible. These competence carriers are corporate resources and like any other asset must be surrendered to collaborate and contribute to the development of corporate opportunities. As a provider of strategic initiatives including strategic planning support of which competency framework development is an integral part. I encourage strategy teams to include HR representatives in discussion about strategic architecture and the competency acquisition and development process that contributes to the organisation of the future. Sadly very few take this opportunity and as a result are slowly eroding their ability to compete in emerging markets..
I’m getting in touch as we are nearing the end of our competency framework project now, albeit in a more little more detail than we had first planned. We are currently in the process of finalising competency standards and setting up the IT system to be able to run assessments with a plan to roll out in the summer. It would be good to share the finished project with you if you would like to see how it turned out…Your final words resonate with me in particular as we are often reflecting and explaining to stakeholders where this began. To be able to show evidence of linking to the business strategy with all our Directors bought in, gives us the weight this needs as it approaches the launch phase. Is your company eroding or emerging?